The superior design of the Insulation Displacement Connection (IDC) technology terminal blocks reduces wiring installation time and labor, especially in high-volume applications. IDC terminal blocks are suited for applications in automated equipment and machine tools, packaging and material handling machinery, railway/mass transit systems, petrochemical, and any other application requiring highvolume connections for low-voltage control and signal circuitry where labor cost reduction and ease of assembly is desired. These terminal blocks are designed for long term use under demanding conditions. 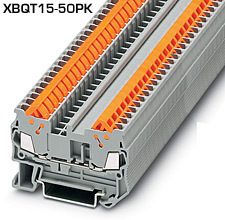 The XBQT Series allows for wire to be connected without any prior stripping. The quick connection provides up to 60% reduction in wiring time. One turn of a standard screwdriver results in a simple, fast and reliable connection. The XBQT is operated with a standard screwdriver. The switching states are clearly signaled by engagement points in the start and end positions. Solid and stranded wires of 0.25 to 2.5 mm2 can be wired without the use of ferrules. Stripping the wire is not required. The wire's insulation is cut open when it is properly connected. The wire is securely placed in the end position where it makes large-area, gas-tight contact. Connections are made in seconds! The Multi-Conductor XBQT IDC terminal block has the fastest connection time in a compact design. The space-saving front connection design offers additional space for wiring between the cable ducts. The double bridge shaft can accommodate individual chain bridging and step-down bridging from other terminal blocks. The XBQU hybrid terminal block offers the best of both worlds. One side offers the time-saving advantage of our insulation displacement connection technology while the other side offers a universal screw connection. Use the IDC side on the internal (factory) control cabinet side and the screw connection on the end customer (field) side.